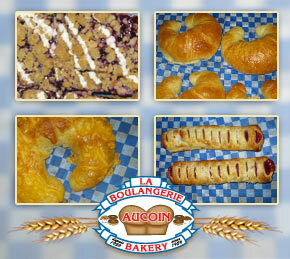 The Aucoin Bakery produces a wide variety of fine baked goods to plenish the kitchen table as well as store shelves. From our home style breads, pies and sweets to our variety of kaiser sandwiches, you are sure to find something to satisfy your appetite and complement your favourite dish at the Aucoin Bakery. Consult our list of offered products and discover why the Aucoin Bakery is Cape Breton's first choice when it comes to home style baked goods. Our only bread that has eggs and skim milk powder. So moist and low in sodium. A must for whole wheat lovers no additives or preservatives. We slice this bread for a beautiful sandwich or toast. Low in sodium. Try our newest bread! 60% whole wheat flour and 40% white flour is an excellent combination for this bread. This is for people who find that 100% whole wheat is to heavy but still want the goodness of whole wheat. We can slice this bread on premises. Low in sodium. This bread is made with wheat flour and has both cracked and whole flax flour. Everyone knows how healthy flax is. We can slice this bread on premises. Our original recipe modified to please those who count calories. This bread has no sugar and no shortening but still tastes amazing! Must be tried to believe! Our original whole wheat flour recipe modified to please those who count calories. This bread has no sugar and no shortening but still tastes amazing! Must be tried to believe! This 10 grain bread is sweetened with molasses which makes it rich and moist, stays fresh and is dark bread. We can slice this bread on premises. Made with white flour, rolled oats, bran flour. Delicious, moist and great as a sandwich, no additives or preservatives added, excellent source of fibre. We can slice this bread on premises. White flour is the base for this wonderful bread which is sweetened with molasses and has lots of raisins. Delicious as is or toasted. Our dark Russian rye flour makes this a savoury, heavy and dark bread, just add poppy seeds and round it and you have lovely bread. Made with the same recipe as our bread, these burger buns are soft and moist and perfect for summer BBQing. Our only bread that has eggs and skim milk powder. So moist and low in sodium. A must for whole wheat lovers no additives or preservatives. Low in sodium. Our delicious white bread is crusty on the outside but soft on the inside! This is the same recipe that started our business over 50 yrs ago, no additives or preservatives added and low in sodium. Our only bread that has eggs and skim milk powder. So moist and low in sodium. A must for whole wheat lovers no additives or preservatives and low in sodium. Rich and moist, made with fresh bananas and semi-sweet chocolate chips. Grandma’s recipe, moist and light dough (no sugar) with just a bit of spices for a great flavour. Made with a flaky crust and Nova Scotia's McIntosh apples. Delicious, warm or cold. A caramel custard pie topped with meringue. It is definitely a local favorite. A custard pie loaded with coconut on a traditional pie crust and topped with sweet whipped cream and toasted coconut. Made with a flaky crust and with dark raisins, grandma's recipe! Made with a flaky crust and locally grown blueberries. “Just like your mom used to make". These are made with shortbread cookie dough, date filling and a maple icing, otherwise known as Pork Pies, delicious! Made with biscuit dough. Made with lean beef and pork seasoned with onions, salt and pepper. Great for lunch with either soup or salad. Made with biscuit dough. Made with skinless boneless chicken breast and lean pork, seasoned with onions, salt and pepper. Delicious hot or cold. Made with biscuit dough, lots of butter, brown sugar and cinnamon, a delicious treat! Available only during lent and Easter, these buns are full of cinnamon and raisins. Cooked daily to perfection. Made with rolled oats, whole wheat flour, Splenda, semisweet chocolate chips and locally grown cranberries, this cookie is perfect for those who need to watch their sugar. Our everyday version of a holiday fruit cake, they are loaded with candied fruit in a sweet cookie base. Made with brown sugar and lots of rolled oats, just like grandma used to bake. Moist and delicious, plain or try them with raisins or chocolate chips. Rich and moist dough decorated with vanilla or chocolate icing and sprinkles. The kids will love them! Moist and red chocolate dough decorated with vanilla icing and sprinkles. The kids will love them. Made with sweet dough and locally grown blueberries. Try our bran muffins, ideal for a light breakfast or evening snack. A vanilla based muffin swirled with a cinnamon and brown sugar mixture. Made with sweet dough and locally grown cranberries. This is not an Acadian recipe but a Scottish one. It is made with rolled oats, white flour, sugar and shortening, excellent for those who are allergic to eggs and milk. This dough is sweeter than a roll but lighter than our sweet pastries. Delicious with either soup, chowder or even with preserves. Try our delicious blueberry scones for either breakfast or an afternoon snack. Try our delicious cranberry scones for either breakfast or an afternoon snack. Try our delicious raisin scones for either breakfast or an afternoon snack. Moist and chewy brownie with chocolate chunks, iced with chocolate and white chocolate icing and drizzled with chocolate. Made with lots of chocolate, so moist and chewy, with chocolate icing and drizzled with chocolate, sure to satisfy any chocolate craving. A rolled oat and coconut crumb bottom and topping with dates as the filling, exactly what you’re expecting! Rich and moist cake with carrots, raisins and a cream cheese icing topped with walnuts. Looking for something not too sweet? This lemon square is very chewy with lots of coconut and a tart lemony filling. A vanilla cheesecake drizzled with chocolate and caramel syrup on a graham wafer crumb crust. Sugar & Chocolate Chip Cookies – Our sugar and chocolate chip cookies are moist and chewy, exactly like a good cookie should be. Caramel delight – Very chewy and sweet, with coconut, pecans, topped with caramel, chocolate and white chocolate coating. Please stop in and check our assortment of squares, turnovers, and croissants. You will be pleased and tempted to try our assortment. Variety of fresh sandwiches wrapped and ready to go. Try one of our many varieties of freshly made sandwiches prepared on an assortment of our very own home style kaisers. The perfect snack to take along your hike in the Cape Breton Highlands or for your day at the beach! Notice: The Aucoin Bakery is dedicated to providing fresh quality products. Selected products may only be available during the summer season. Please drop-in to see what we have in store or call your local retailer.